When the Opportunity rover landed on the red planet in 2004, NASA only intended to drive it for about 1 kilometer (0.62 miles) within 90 Martian days. 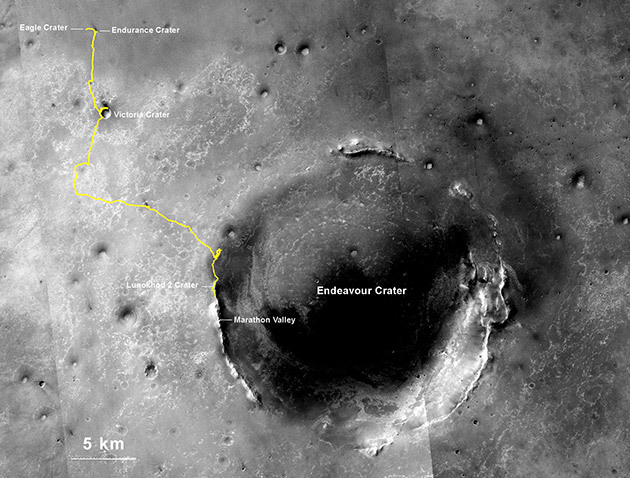 But the rover turned out to be a hardy Mars explorer, and on its 10th year on the planet, it has finally broken the record for the longest distance a vehicle has driven outside Earth. The Opportunity has recently accrued 25.01 miles of driving on another world, dethroning Soviet Union's Lunokhod 2 rover, which drove 24.2 miles on the moon in 1973. While that's a huge accomplishment for a vehicle that was never supposed to last for more than year, Mars Exploration Rover Manager John Callas says what truly matters is "not how many miles the rover has racked up, but how much exploration and discovery we have accomplished over that distance." So, what's next for this tough ole machine? Not retirement, that's for sure. NASA's hoping it still has what it takes to drive just a bit further and reach the next major investigation site more than a mile from where it is today.